*if i get the PS1 i'd forego a number of other items on the list. i am slightly obsessed with getting a burgundy crossbody bag. **an open item that may be a completely random/fantastic/vintage find. I love Vince. I own a dolman sleeve tee and a wool dress by the label and both have lasted for ages despite being worn constantly. Am sure you would get tons of wear out of the Breton. 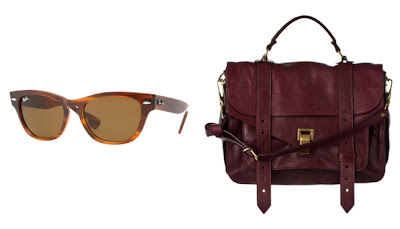 That burgundy leather bag is such a lovely, rich colour. Have heard mixed reviews about the PS1 though - that the hardware and the leather isn't particularly sturdy. I think http://assembledhazardly.blogspot.fr/ had a post on it if I am not mistaken. Did you ever get the JCrew Edie bag? Am thinking of getting it in plain leather, but wondering if the quality is all that. Curious to know what you think. Vince is one of my favorite go-to brands for really great quality elegant basics. they make some of the best cotton/jersey tees and knits around. and my experience is the same as yours - all of my Vince pieces have lasted incredibly well after seasons of wear. i've read amanda's post on her PS1 - as well as looked through a lot of the TPF ladies' posts on theirs. i think amanda was unhappy with the slouchiness of her bag after it got worn in. i also think she had paint chipping issues on her black/black PS1 hardware. i love the burgundy with gold hardware though...ah, we'll see. no i didn't - several bloggers did comment that the Edie does have great leather and quality make, so i think you should go for it! if there's a problem jcrew does have a very reasonable return/exch policy. In my experience gold or polished brass hardware tends to look good for a lot longer than silver or coloured hardware. Also looks more elegant in my view, depending on how it works with the leather colour. Still mulling over the Edie - it's a lovely design, the trouble is JCrew's international prices are just shocking compared with the US prices. And I am not sure if I want to pay THAT much for one of their bags! Am going to think over it some more before I commit. Just had to chime in here: My bag was an older PS1 made of lambskin and had enamel hardware -- the newer bags apparently are sturdier and are made of calfskin. Also, I haven't heard of any problems with the brass hardware. There are however, some issues with quality control of the straps etc. The bag is definitely a beautiful, timeless one, I just decided that for what I had paid, it wasn't worth it. I only had a Nook, a wallet, cellphone and some really tiny knick-knacks and it would sag. thanks for the additional review, Amanda! that's really good to hear that they switched to calfskin - sounds like it's definitely much more durable and less prone to losing its shape! I like the print on the wrap dress and the shift is a classic. I like the idea of a linen pull over too. As for me, I've finally found navy pants! I’m considering white pants—linen for casual, and then a dressier version. But that’s not a priority; it’s just that I happened to find some that I like. And I owe myself some jewelry. Other than that, I’ll be on lock down soon, unless I need something like basic tees or there’s a really good sale on something I’ve casually considered. I thought I wanted white jeans a few years ago, and then the fitting room mirror insulted me. I'm one of those people that really cannot wear skinny jeans, especially in white. :| So loose white pants it is. Yeah my goal is to be someone that only emerges to buy socks or jewelry ;) But there's always some crap I'll convince myself I should have. I love that exact DVF dress and have drooled often over it. It's just already too warm to get use out of a long-sleeve dress, so I'm waiting until fall to get another (or several). Since we're heading for a northern summer vacation soon, all my sartorial planning is going to that. I want bikini tops (my first) since we're staying right on the ocean with a deck (!!!!!!!!! my dream come true!!!!!!!! ), as well as a modest pair of shorts to wear with them. I grabbed another light-weight blouse, and someone's getting me some jeans. So other than those things, I'm acquiring big, beautiful scarves that I can wear as dresses or light tops. There's something so fun about that! 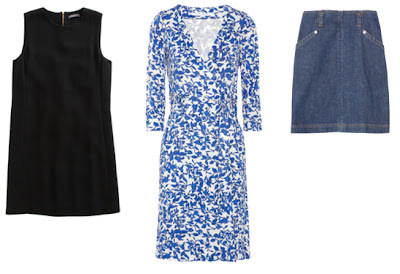 please share your vacation wardrobe on your blog! I've been eying APC's oxford shirt in blue with a mandarin collar. However, since I've started working in Hong Kong, I hear many good things about local tailors making quality shirts for very reasonable prices. So I am not quite sure which way I want to go yet. Out of curiosity, what's your take on custom made items? ooh i really like some of CO's heels too, they're just so colorful and fun! i'm the same with summer dressing - i just need to stay relatively cool and comfortable, and the rest is secondary. A friend of mine was likewise very unhappy about the PS1 bag, I think the leather stretched too much and it just didn't hang very well. I guess it's something worth considering. I love that Margaret Howell top - it looks exactly like a Steven Alan top from last summer that I mildly regretted not buying, which is very curious. But I'm content with admiring things from a distance at the moment. I interviewed a bespoke shoemaker some weeks back and have been very interested in bespoke at the moment - I'm dreaming of the perfect partially-lined linen blazer. But that's such a staggering investment (at least, with the tailor I have in mind) that I'm not in a hurry to make a decision. In the meantime, I'm quite happily working my way through my wardrobe. hmmm...interesting. yeah it's annoying that the PS1 is the only bag of this design and yet there are mixed reviews here and there. :P what kind of leather/size was your friend's bag? i doubt i'd put in very heavy things (ie: laptop) if i did get one; but it's just such a gorgeous design for a light work/weekend bag. agh! partially lined linen blazer is exactly what i want to wear all summer long. i found a gorgeous one here by a local designer, but so far have only admired it a few times and reluctantly left it on the rack (still pricey even on sale...). You could try Belen Echandia - their New York satchel is pretty similar to the PS1, and I can say from experience that the leather and gold/brass hardware is very durable. And they can customise it in any leather or size you want. I have a burgundy satchel-style bag from Topshop, it used to have the loveliest color. Yeah, used to - I absentmindedly left it near a window for a while when I wasn't using it, and the color faded. And so I learned my lesson: if the bag doesn't have a dust bag - make one! I actually went on a little S/S shopping spree just a few days ago! I have been dying to check out the brand Complex Geometries, and ordered a tank and a dress. I have also ordered a pair of studded/embellished sandals, and will be on the lookout for a proper grown-up boyfriend style watch when I visit Oslo in a few days. Oh, and that wrap dress is stunning, it reminds me of porcelain tea cups! I am such a Fall/Winter person when it comes to clothes (ironic, since I'm from Alabama and hate cold weather). I've been "struggling" to find items to spend my money on! I've spent a lot of time just searching eBay for old items. However, I hope to buy a few things from APC and Steven Alan (on sale). I'm always on the lookout for jeans; I've got my eye on Current/Elliott. Lastly, I'm not sure how it would look on me, but I love the green leaf print Ilana Kohn dress. I really want to buy from the smaller designers I follow online. i know what you mean - i am totally a F/W person when it comes to making more 'important'/pricier purchases. I love love love the PS1 in burgundy and I would definitely stick with the medium size so that the leather doesn't sag/stretch as much. Oh yeah, I'll also be in Shanghai this weekend! Perhaps we'll run into each other? I'm staying with a friend in the French Concession area. I love the sailor shirt too! I think that I've way too much shopping for spring/summer, but Isabel Marant's Merry sandals are still on my list! Ah, APC skirts, if only a handful of them were a few inches longer. I find that so many of the looks that I am drawn to lately are somewhat hit and miss for me, sizing especially - which is particularly upsetting considering how much I adore Margaret Howell....still quite hesitant to purchase the clothing (but can happily ogle the accessories!). I would love to find more online info regarding MH fit. Have my eye on a pint/mint APC breton right now, too but cannot commit (how many can I justify? ), however I am happy to watch from afar. The wrap dress above is very fresh & pretty...the wrap is something that I have never actually sampled personally, not sure why. And however much I love summer clothes, for the meantime I have all but given up planning any kind of summer wardrobe here. For the last 3 yrs or so we have experienced something like 70% winter/ 30% mild weather or spring-like temps. It hasn't seemed worth the expense to indulge. It is so very confusing attempting to plan seasonally here in the UK, for so many items purchased for the warmer months go unworn, year after year. But I live in hope! ah, i do remember it being unseasonably cool in august in london. but i suppose it's more preferable than sweltering city heat! as for sizing, i've always found that Net a Porter has very helpful measurement and sizing info for each item - and their customer service people are unfailingly polite with inquiries! Great wish list, I love that it is simple and succinct. And I'd saY go for the PS1, I have the PS11 and have been lugging it around since I got it, and I still adore it. My wish list consists more of past season pieces. Like the Isabel marant renell jeans, and the Charlotte Olympia kitty flats (which I just purchased, now it's a waiting game to pick them up when I'm in london). I haven't seen so much that I need to add to my wardrobe, I must say this comes as a relief. I do need to stop trawling eBay and trade me though, that is for sure! thanks jamie-lee! :) i'm curious what kind of leather/color is your PSII. how has it held up since you got it? Oh I love reading these lists of yours! You always have the best taste and thought out selections. A burgundy crossbody sounds lovely and very versatile.